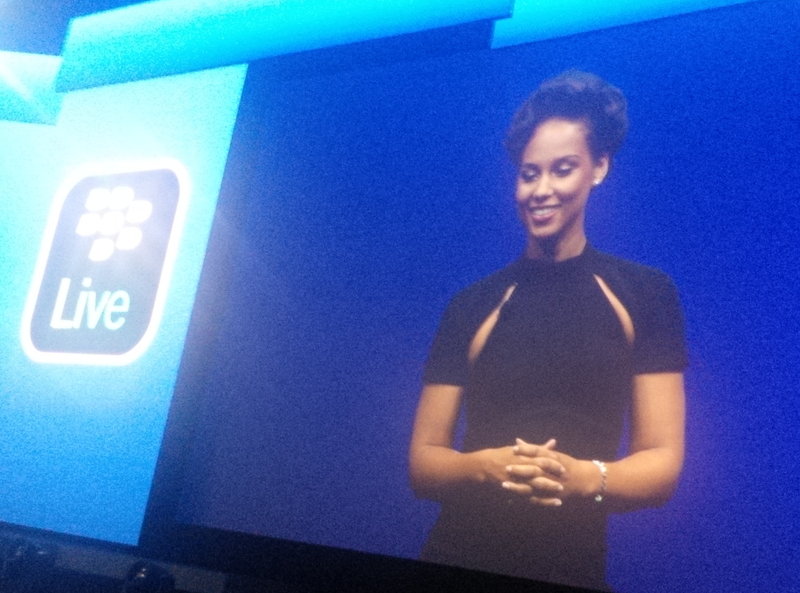 BlackBerry Live and BBJam: the week in orlando was an energizing week for me as a developer of mobile business apps. my BlackBerry 10 app ‘ekkes Tea Timer‘ got the “Built For BlackBerry” certification. I’m proud because now 3 of my apps got the certification. BlackBerry Live itself started on tuesday with the general sessions and what a difference compared with last year: Thorsten Heins was relexad and proud to present what happened last months, what’s ready-to-go now and what’s already in the pipeline. Q5 is targeted as a lower-priced device and will be very welcome in emerging countries, as low-cost device for enterprises or just for students. For me as a developer there’s no difference to develop apps: Q5 has same screensize as Q10. A new feature was presented for BBM (BlackBerry Messenger): BBM Channels. Channels will make it easy for companies to get into direct contact with their customers. But everyone can create his/her own channel. 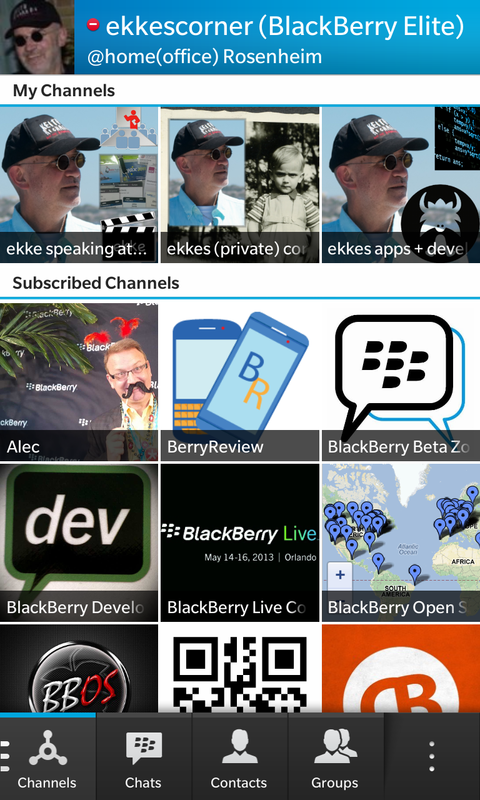 BBM with Channels is available as open beta and can be tested by everyone. You only have to go to BlackBerry Beta Zone and register – its free. BBM channels are something like Tumblr: Images plus text with comments. As a publisher you get some statistics about subscribers, visitors etc. If you create your own BBM Channels please don’t repeat the stuff you already tweet or blog about. BBM channels should be different. I will add subscription of my ‘apps and development’ – channel from inside my apps. I can deliver this stuff through BBM only and reach exactly the focused target. My other channels will contain additional content not already published through twitter and blog and will provide some extra value for BBM users. 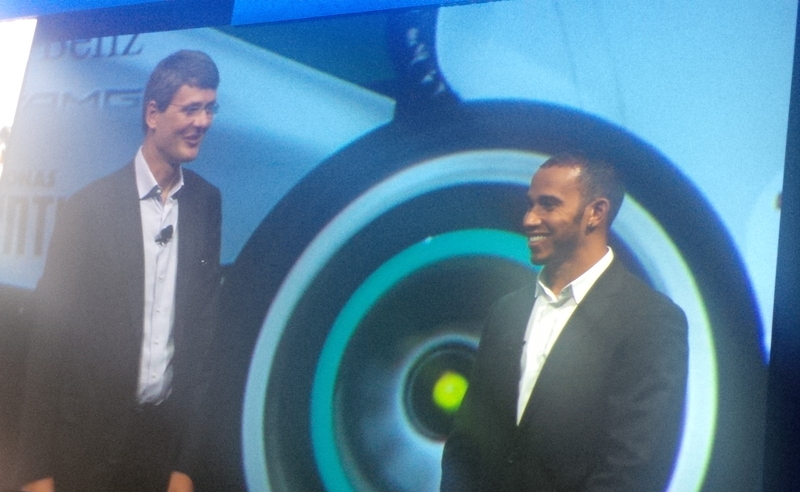 One of the first channels (presented at BB Live) was from Mercedes AMG Petronas – perhaps you already know that BlackBerry is sponsoring Mercedes F1 Team and Lewis Hamilton joined the BBLive conference in Orlando. 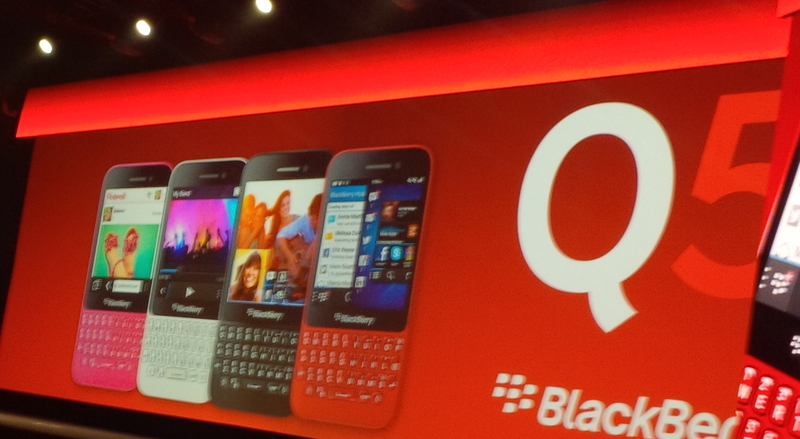 The next announcement was a real surprise: from summer this year BBM will be available for iOS and Android - for FREE. 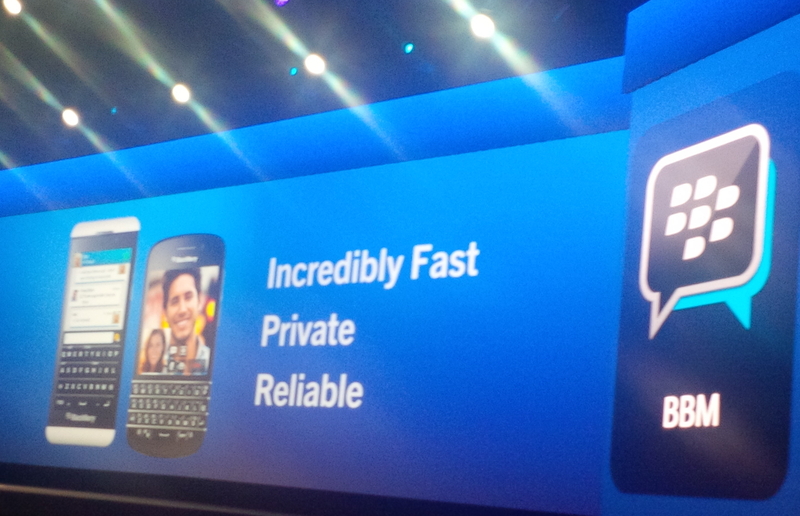 BBM is fast and secure, communication is private and it’s a great chance for BlackBerry. Curious to see how the messenger market will look next year. One or two years ago this decision would have been dangerous for BlackBerry – but now with all the new BlackBerry 10 devices there’s a great chance for mid and long term to bring new customers to BlackBerry. Using BES 10 (BlackBerry Enterprise Service 10) you cannot only manage BlackBerry OS, PlayBook and BlackBerry 10 devices – you can also manage iOS and Android devices. These are great news for companies to manage all devices of their employees from one single point. 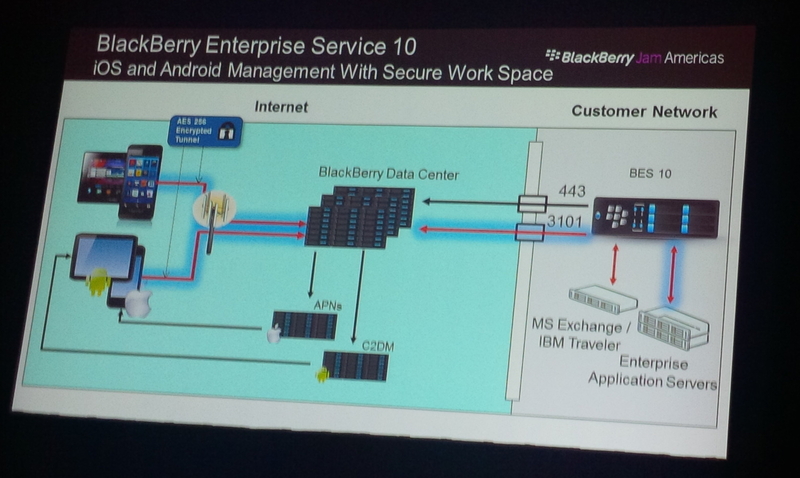 BlackBerry 10 devices managed by BES 10 automatically get BlackBerry Balance: a work perimeter and a private perimeter. IT can manage work perimeter but has no access to private area. And apps running in private perimeter have no access to work data. It’s like two smartphones from one device. BES 10 itself is free to download and licence costs are low (around 70 € per user) – so BES 10 is not only for enterprises, but also small companies or even for you and me to get some extra security. From summer Secure Workspace will be available for iOS and Android: an encrypted container with an own secure Browser and software to read and edit documents. Also email and Calendar. Events will be pushed into native Notification center of the platform. If you want to add more iOS or Android apps inside the Secure Workspace it’s easy to wrap them to become a secure app. For more informations take a look at the Session JAM53. 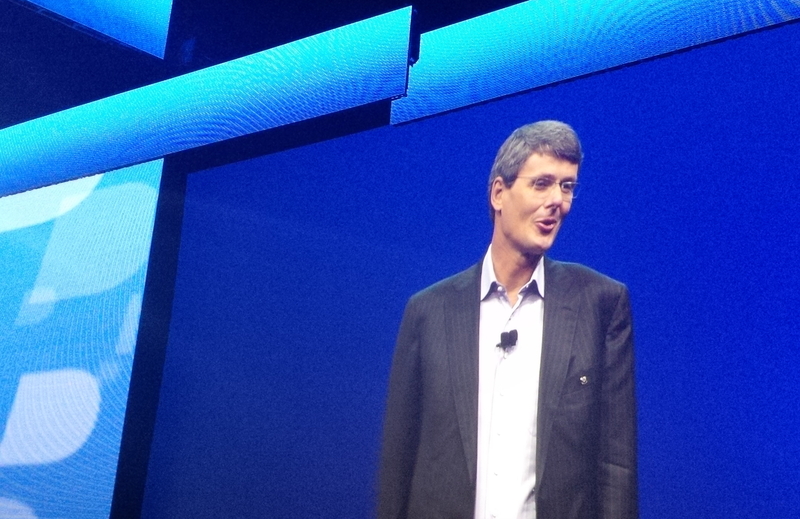 Thorsten Heinz told us, that BlackBerry 10 will manage all kinds of mobile endpoints in the future. Not only smartphones, but also Cars and more. This was the next surprise for me: BlackBerry 10.2 will be available for Cars, too. In the past the QNX software for Cars was based on HTML5 – now it’s BlackBerry 10 which means you can still use HTML5 but also native Cascades apps – good news for me. 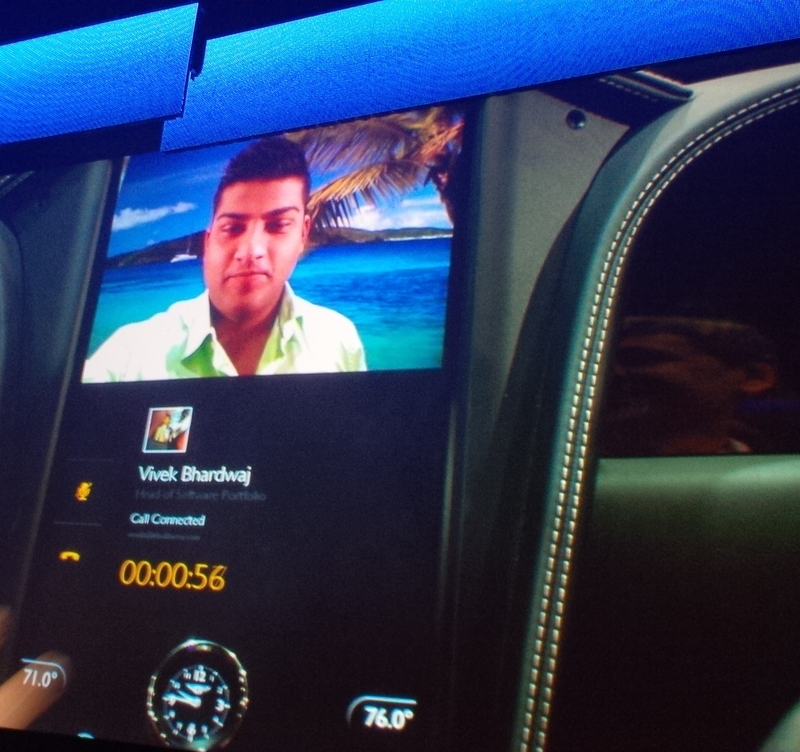 There was a cool live demo of BBM Video Chat from inside a Bentley with BlackBerry 10 on board. BTW: the software recognizes if the car is driving and will switch then automatically from Video to Audio Chat. Next demonstration was to start a software download to the Car from BlackBerry 10 smartphone. 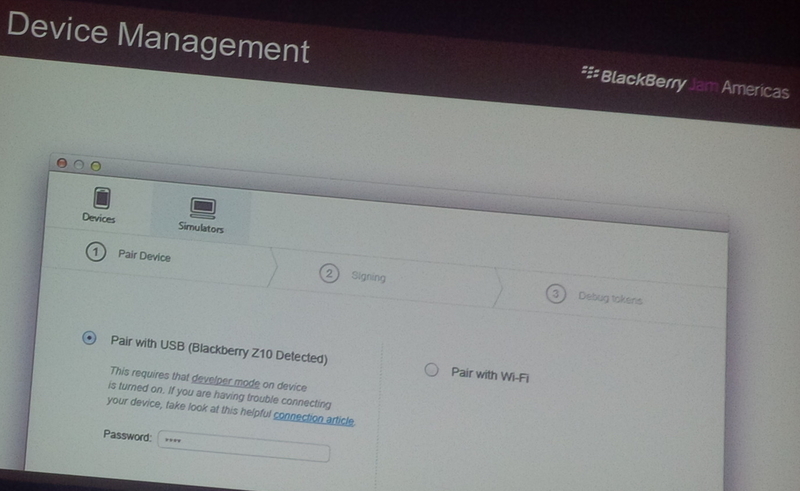 BlackBerry 10.2 will get some cool new features like active USB Hub, wireless HDMI using Miracast and WIFI direct. This will enable apps for more mobile scenarios. There was a demo from gaming: starting a game on a BlackBerry 10 Z10 (Touch), connecting this device with a GamePad Controller and playing from the GamePad. Then playing on from the GamePad to the big screen via wireless HDMI. There was a session on headless apps: ‘Background Services – Event Driven Processing for your Application’ (JAM47) – a feature many BlackBerry developers are waiting for. On old BlackBerry OS (Java) you could run background applications. The risk of background services is consumation of processor power and drying the battery. At the session we discussed some different scenarios and HowTo use headless apps together with Invocation Framework, Push Services and Notifications. Looks good what will come to BlackBerry 10 – first things will be available with 10.2 where the beta will start in June 2013. Step by step BlackBerry maps become better: since 10.1 you can really use custom maps in your apps. I had a session about ‘Maps in your Apps’ (JAM69) together with Shadid Haque from BlackBerry. Also some infos on maps for developers are here. My other session was about ‘Invocation Framework as heart of your business apps’ (JAM56) where I demonstrated some use-cases of Invocation Framework and how it helps lazy developers to create cool applications following the workflow of users without jumping from one app to the next and back: most should happen inside your app so the user doesn’t know that he(she in reality is using some more apps. Next good news for me as a developer of native apps: the Momentics IDE (based on Eclipse CDT) was completely redesigned. Eclipse 4 (e4) removes the barriers and Eclipse PlugIn architecture are the keys to a new Momentics IDE ! BlackBerry created a mixed team of designers (Cascades – TAT) and coders (QNX) and first results were presented at JAM22 session. I remember my first steps with Momentics IDE and compared to Eclipse as Java IDE it was a big step back. Now with the re-launch of Momentics based on Eclipse 4.2 I’m sure Momentics will become a first-class IDE. All parts were redesigned from Welcome page to target definition and build-launch-process to make it easier for first-time users and also much smoother for experienced developers. Momentics now has a flat UI, new Icons and new color scheme. This is only the beginning – new features already in work for a more advanced tooling, templates for headless apps and more. First 10.2 beta will start with 10.2 SDK beta in June 2013. I will try it out and report about the new out-of-the-box experience. As I already wrote more then a year ago: BlackBerry 10 is not only a new mobile OS – it’s a complete mobile platform. Step by step the vision of BlackBerry becomes visible. There were two important decisions done: akquiring QNX and TAT. The swedish designers from TAT provided Cascades – the framework bringing us the BB10 Flow with some cool new and intuitive gestures and great new UX. QNX is used all around the world in critical environments like ISS. … and now also powering up BlackBerry 10. Two years ago I thought ‘why the hell did BlackBerry not fork Android’ – in the meantime I know QNX was a much better decision. BlackBerry 10 on QNX is built totally new from scratch with all the requirements from mobile today and not 5 years ago when Android and iOS were born. (BTW: I switched from I to Z – and now if doing something on an iPhone I miss the more intuitive BB10 gestures and feel like “yesterday”). As last year I enjoyed the night at Universal Studios – this time with a great show performed by Alicia Keys: The Keep Moving Experience in collaboration with Miguel, Alabama Shakes, Maria Gadú and Cedric Gervais. At BB Live Global Sessions Alicia talked about ‘Woman in Tech’ and announced the BlackBerry Scholars Program to engage young women at every step of their education from high school to college, and as they rise through the workforce. Alicia also presented an own Session at BlackBerry Live about ‘Women in Tech: Redefining Ambition Daily’ BAB09 together with Reshma Saujani, Girls Who Code – Elisa Camahort-Page, BlogHer and Leila Janah, Samasource Founder . This year a new track arrived at BlackBerry Live / BBJam for entrepreneurs and startups. Take a look at sessions available now on demand for free.